OXFORD, Miss. 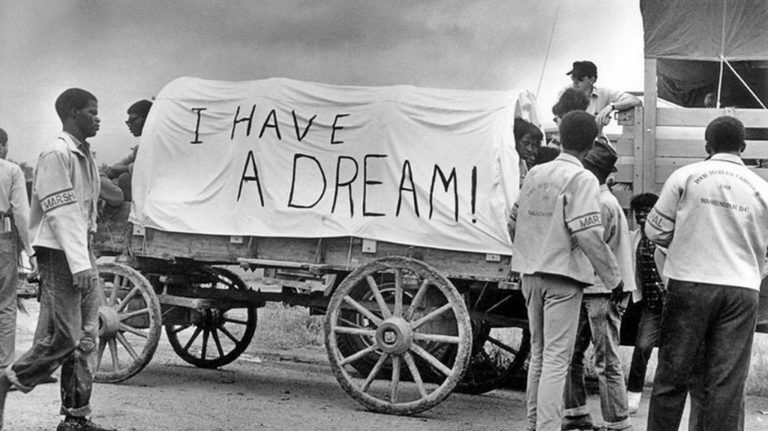 – Fifty years ago this April, Martin Luther King Jr. was scheduled to lead 28 wagons pulled by mules in a caravan from poverty-stricken Marks to the nation’s Capitol. While the civil rights icon’s assassination delayed the Mule Train, the campaign for jobs and justice did eventually make its 1,000-mile, monthlong trek from Quitman County to Pennsylvania Avenue. As part of a yearlong monthly series of events commemorating the anniversary of that historic event, the University of Mississippi is hosting a two-day national conference for academicians and other interested people. “Honoring the 50th Anniversary of the 1968 Mule Train/Poor People’s Campaign by Implementing Classroom Theory in Marks, Mississippi” will be held March 28-29 at various locations on campus and in Marks. The university’s McLean Institute for Public Service and Community Engagement, Center for Population Studies, and the Department of Sociology & Anthropology are co-sponsors. A community-based participatory research workshop for faculty, students and all interested members of the public is set for 11 am—1 pm March 28 at Insight Park. “This workshop will cover the types of resources available to faculty who wish to do this kind of work, best practices in working with communities and engaging in some networking among faculty who already do this type of work,” said Annie Cafer, UM assistant professor of sociology and anthropology and coordinator of the conference. John Green, professor of sociology and director of the Center for Population Studies, is the other co-coordinator. He and Cafer are also presenters. This photograph by Dr. James Goldman along with many others documenting the Mule Train appear in ‘Goldman’s Gold,’ a book published with Macklyn Hubbell. The Rev. Michael C. Jossell Sr., pastor of Mt. Zion M.B. Church in Lambert, will deliver the keynote address at 2:30 p.m. March 28 in Barnard Observatory, Room 105. Jossell plans to discuss his experiences as a participant in the original march and a student walkout in Marks, regarding what progress has been made and what still needs to be done. From 3 to 4:30 p.m. March 29, a panel of faculty and community members at the Jackson Avenue Center, Auditorium A, will discuss their research and work on issues that were advocated during the Poor People’s Campaign. Curtis Wilkie, the university’s Cook Chair and professor of journalism, will moderate the discussion. The panel will be live-streamed to Marks to let the audience there participate and ask questions. A community-focused workshop is scheduled for 7 p.m. March 29 in the Reclaimed Building in Marks. Ellen Meacham, UM instructor of journalism, will work with community members on telling their story, documenting what they are doing and communicating it to outside stakeholders. The 50th anniversary observance began in Marks last May and will conclude there in mid-May. Each month honors different Mule Train participants and highlights their contribution to the campaign. A week of special events is scheduled for May 13-18 in Marks to end the observance. Former U.S. Rep. Andrew Young Jr. is scheduled to speak at the closing ceremony. An early leader in the civil rights movement, Young served as executive director of the Southern Christian Leadership Conference and a close confidant of King. He later became active in politics, serving first as a congressman from Georgia, then U.S. ambassador to the United Nations and finally mayor of Atlanta. Mississippi Valley State University Rural Farm Policy Program. King was affected by a pervasive sense of hopelessness and widespread hunger when he visited Marks in 1966. At the suggestion of fellow civil rights icon Marian Wright Edelman, he decided to lead the campaign against poverty two years later. The caravan was scheduled to depart when King was assassinated while standing on the balcony of the Lorraine Hotel, now the National Civil Rights Museum, in Memphis. A book, “Marks, Martin and Mule Train: Marks, Mississippi, Martin Luther King, Jr. and the Origin of the 1968 Poor People’s Campaign Mule Train,” (Xlibris, 2014) by Hilliard Lawrence Lackey, is available. For more information about the Mule Train 50th Anniversary Conference, email Annie Cafer at amcafer@olemiss.edu or John Green at jjgreen@olemiss.edu.